SCOTUS just delivered a big win to Texas women and sent a message to states that are thinking of passing restrictive abortion measures similar to HB2 that require hospital admitting privileges for providers or unnecessarily regulate clinics: They're unconstitutional and place a "substantial obstacle in the path of women seeking a previability abortion." 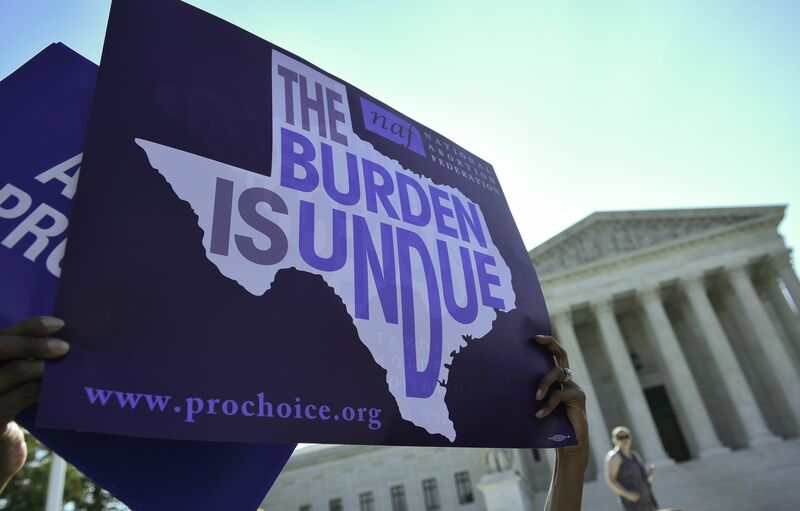 In other words, they're an undue burden on abortion access. That's awesome that the Supreme Court ruled the right way for women, but the reason why is even better. Basically, SCOTUS isn't buying the anti-abortion activists' argument. We have found nothing in Texas' record evidence that shows that, compared to prior law (which required a "working arrangement" with a doctor with admitting privileges), the new law advanced Texas' legitimate interest in protecting women's health. They couldn't point to one woman in Texas history that would have been helped by such a law. In other words, Justice Breyer, along with the four co-signers, aren't buying the anti-abortion argument. In fact, there's a lot of evidence that this sort of law hinders women's access to a safe and legal abortion. SCOTUS continued, "The record evidence indicates that the admitting-privileges requirement places a 'substantial obstacle in the path of a woman's choice.'" No surprise there. The anti-abortion argument has been polished by PR experts to change the conversation from limiting women's rights to protecting their health and well-being. That makes a better argument, but it simply isn't true. Thank you Justice Breyer, et. al. for seeing through the deceptive language. Those closures meant fewer doctors, longer waiting times, and increased crowding. Record evidence also supports the finding that after the admitting-privileges provision went into effect, the "number of women of reproductive age living in a county ... more than 150 miles from a provider increased from approximately 86,000 to 400,000 ... and the number of women living in a county more than 200 miles from a provider from approximately 10,000 to 290,000. Sounds like an undue burden to me. Plus there's problems with the dissent's argument — or lack thereof. They wrote "H. B. 2 caused the closure of some clinics" but claimed other clinics may have closed for other reasons — and therefore should not be countered or considered in the case. What are those other reasons? The dissent didn't offer any evidence of these mystery forces. Suppose that we know only that a certain grocery store serves 200 customers per week, that a certain apartment building provides apartments for 200 families, that a certain train station welcomes 200 trains per day. While it is conceivable that the store, the apartment building, or the train station could just as easily provide for 1,000 customers, families, or trains at no significant additional cost, crowding, or delay, most of us would find this possibility highly improbable. So, no, Justices Roberts, Alito, and Thomas — not to mention the anti-abortion activists and legislators thinking about passing similar laws elsewhere — it does not make sense to make abortion clinics prepare for situations that the historical evidence implies will not occur. Be prepared to face this increasingly progressive SCOTUS and the wrath of logic.